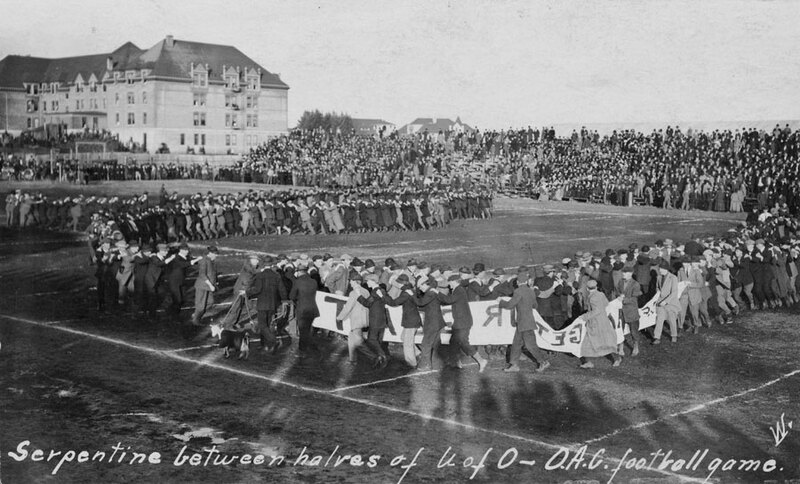 Fans serpentine at halftime of the Civil War football game, 1910. The Special Collections & Archives Research Center (SCARC) provides access to reproductions of its content as a means of facilitating research, publication, and scholarly discourse. Creation and use of reproductions made available through self-service copying, duplication by staff or other parties, and online resources including Oregon Digital and Flickr are subject to the guidelines enumerated below. SCARC provides researchers with digital access copies of materials under the scope of fair use. Any individual or organization conducting or requesting digitization of copyrighted materials is responsible for determining whether the subsequent use of this reproduction falls within the parameters of fair use. Upon approval, researchers may take images using SCARC’s self-service Bookeye scanner or a personal digital camera. Researchers unable to conduct research on site may request that access scans be created by SCARC staff. This service is limited to paper records and is dependent on staff availability. Turnaround time may exceed two weeks. SCARC may submit requests for high resolution scans or reproductions of non-paper formats including slides, glass plate negatives, and legacy audio/visual formats to outside vendors for fulfillment. Individuals or organizations requesting reproductions are subject to any fees assessed by that third party and will be notified of the estimated cost prior to duplication. Items in the public domain – These may be used freely and without restrictions. Items for which the copyright is owned by Oregon State University – Please contact SCARC for permission to use. Items for which the copyright holder is an entity other than Oregon State University – It is the responsibility of the user to determine copyright status and seek permission from the rights owner(s) where appropriate. If an individual or entity intends to use copyrighted material in excess of fair use as determined by U.S. copyright law (title 17, United States Code), it is incumbent upon the user(s) to seek permission from the copyright holder(s) prior to use. Failure to do so may constitute copyright infringement. SCARC does not assess fees for use of any materials in its holdings or require users to receive permission from SCARC to publish, display or distribute materials whose copyright is held by an entity other than Oregon State University. However, SCARC asks that users seeking to publish, display, or distribute any item from the SCARC holdings notify SCARC using the Notification of Use form. This enables SCARC to collect data necessary for enhancing user access. 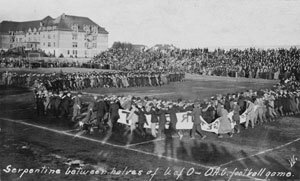 SCARC also asks that users accurately attribute the item in a caption, citation, or other appropriate format to the Oregon State University Libraries Special Collections & Archives Research Center. The preferred attribution is “From the [Collection Name], OSU Libraries Special Collections & Archives Research Center.” Guidelines for attribution can also be found on the Notification of Use form. SCARC can be contacted by email at scarc@oregonstate.edu or by phone at (541) 737-2075. The Special Collections & Archives Research Center provides free access scanning service for off-site researchers. This service is limited to requests no larger than fifty pages of textual material. Access scans are defined by SCARC as 150-dpi images scanned to PDF. Scanning requests beyond fifty pages are subject to the fee schedule itemized below. So too are scanning orders that do not fit within the parameters defined here as access scanning. Very large scanning orders may be referred to third-party vendors, in consultation with the patron. Duplication of Other Legacy Media: Users requesting access to legacy material for which a digital file has not yet been made should be prepared to meet costs involved in the making of preservation masters for SCARC in order to obtain the copies they are requesting. These costs are assessed on a case-by-case basis. A SCARC staff member will work on providing you with a quote after your request for duplication has been made. SCARC is able to process payments made via check. Please contact us for further details.